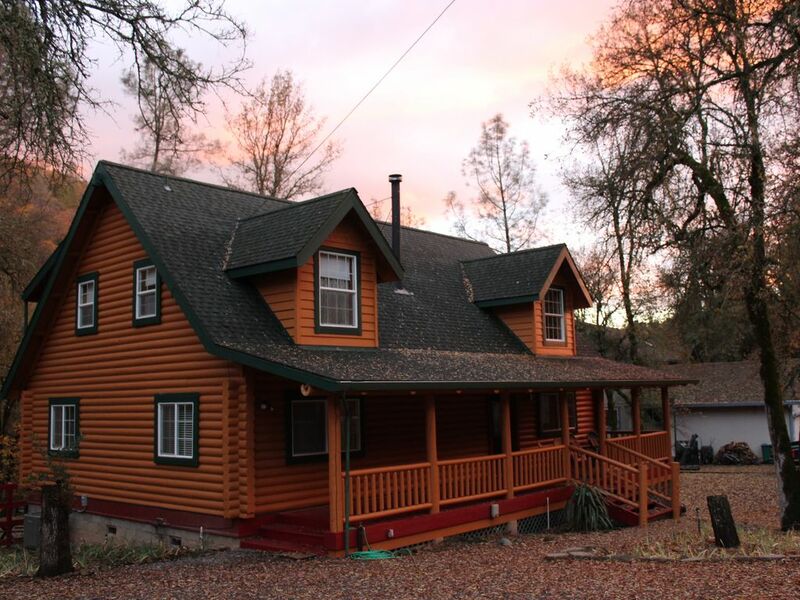 Come out of the city and stay in this beautiful custom log home in a gorgeous, park-like, 10 acre setting. Relax on either of the two veranda-like porches or nap in one of the hammocks as you listen to the stream in the background. After a day of site-seeing, shopping, hiking, golfing, skiing, sledding, biking or just relaxing, soak in either the extra deep antique tub or enjoy the jets of the jacuzzi bathtub. Enjoy the Sundance SPA in the back yard as you listen to the creek, watch the moon rise over the ridge or just bask in beautiful expanse of the country starlit night. You will love the comfort of this property. Hop on your bike for ride into the hills or along the paved country roads. Hike through the trails that you can access right behind the house. Close to the snow -- an easy drive to any of the the nearby ski resorts (Sugar Bowl, Boreal and Donner Ski Ranch, Royal Gorge) snow parks (Yuba Gap, Kingvale and Soda Springs). In Summer, watch your kids play in the swimming hole, jumping off the rope swing, or just gently soak your feet in the stream while quietly reading a book. There are trout in the stream, trails to hike, wildflowers to enjoy. You'll feel as if you've come into a whole new world when you walk into this comfortable and beautiful log home. Enjoy the local flavor of Grass Valley and Nevada City -- music festivals, street fairs, Farmer's Market, Bike races, Blue Grass Festival, World Festival, Celtic Festival, Wineries, Antiques, Golf, Historical center, Mountain biking, Kayaking, Fishing. I am a Cath Lab and ICU RN. Due to life circumstance, began vacation renting 2 of my homes a few years ago and find that I love it. It is a pleasure to share my unique homes. Thanks to all that come to them. I hope that all my guests enjoy them as much as I have. I love the creek and hiking in the woods. Follow the trail across the creek and up to the top of the property where you will enjoy a spectacular sunset. Walking into the house is like something magical. It really is a unique and special place to spend some well-deserved downtime. toilet, combination tub/shower, jetted tub, This bathroom is on the main floor. Full bathroom with both tub and shower on both first and second floors. This property is located in the Sierra Foothill's beautiful Brewer Valley and has the beautiful South Wolf Creek flowing right through the center of it. This property overlooks the stream and looks out into a woods that is available for hiking. There is a trout stream with swimming hole and rope swing. I provide a house phone as cell coverage can be sketchy. You will receive the phone number when you reserve the house. All beds are made and towels are in each bathroom. Extra linens are in the closet in the hallway. You may bring and use your own linens and towels if you would be more comfortable with that. There is plenty of off street parking. Please do not park in the neighbors's driveways or on the street. Wood is provided. Extra wood is stored in the basement and under the back deck. This is not the only heat source. The furnace is programmed for comfort. Open floor plan with plenty of comfortable seating. Large harvester's table....great for large family dinner, retreat meeting, cozy romantic dinner for two or dinner party with your friends. The table seats 8 comfortably and can accommodate 12. Extra chairs in the rec room. Large deck off the back of the house overlooking the creek and the woods. Spa under the stars while listening to the creek. Custom log home, close local golf course, country club, numerous local wineries, miles of local hiking, year round, creek with swimming hole right out the back door, hammocks in the back yard, road bike or mountain biking locally. Close to shopping, sightseeing in historic Grass Valley/Nevada City. Close to local ski resorts and snow parks and the local rivers. My other home is #140231 with most of the same amenities. Check with owner for details. What a peaceful and cozy place. Great location and really nice house. Lots of room for everyone to hang out and have a good time! Diane was a great host and was there for anything we needed. Thanks for everything! The property was EVERYTHING I wanted and needed it to be. Secluded, private and peaceful! My host, Ms. Diane was the sweetest woman. She was easily accessible and gave us privacy!! Next time im in the area I will definitely be staying at one of her properties. Loved this house... one of the best places i’ve Stayed at. My family and i visited this place for the thanksgiving holiday. We’ve stayed at a lot of vrbo’s and this place is at the top of the list. You can tell that the owner really cares about the place as everything is well maintained and well cared for. All of the kids loved playing by the stream and hiking the trail behind the house. The adults enjoyed coffee on the deck and spotting local wildlife. We will be coming back for sure!!! Both the house and yard were absolutely perfect for our needs! My family and I enjoyed this beautiful home very much. It provided plenty of options for everyone to sleep. It's ideal for a family gathering. There's plenty of room/seating to visit comfortably as the living/dining/kitchen area is a large open space. The game room is great and with it opening up to the back yard you still felt part of the group when you were playing inside or outside games. It was fun to walk along the creek as well as enjoy seeing and hearing it from the comfort of a chair in the back yard. I would definitely stay at this house again if the opportunity arose. When my granddaughters arrived they spotted the rope swing and tether ball. They made a beeline to those things before the car was even unloaded. Thank you Diane Stevenson! You have been a pleasure to work with and I'm so glad we were able to meet face to face! You and your husband built a lovely home in beautiful surroundings! It is always a pleasure to have family groups in my vacation rental homes! Am so pleased that everyone was comfortable and had fun! We try to please groups of all sizes and age ranges. I don't always meet the guests but had the pleasure of meeting this group and it was a great! I would welcome them back again as it was a wonderful experience having them! Wonderful property, great for a weekend getaway. Diane is lovely to work with. Highly recommended. Very impressive cabin. However, only 3 real beds available (king and 2 queens). Other guests have to sleep on the sofabed or foton or sofas.in the basement. Distance to nearest grocery store is a long drive through the giant subdivision with many turns involved which makes it easy to get lost (especially if dark out). The rental price seems reasonable at first, but when you add in the $20 per night per person extra charge for any more than two people it becomes overpriced compared to other rentals in the area. It is always interesting to read guest reviews as I learn something from each of them and always strive to improve the experience for all. This house is set up to accommodate difference sized groups, hence the nominal extra guest fee of $20/person as I sometimes have 2 guests and sometimes 10. I tried to come up with a fee that would make it affordable for everybody, but I have made fee adjustments if asked by the guest to do so. This seems to work for most guests. The house has 1 king, 2 queens, 2 single, 1 queen futon (with a regular mattress), 1 sofa bed, 2 queen air mattresses and a sectional sofa. This seems to work for most guests also. I provide directions into Grass Valley in the guest binder that all guests are asked to read. Grass Valley is a 12 minute drive with 3 turns if these directions are followed. Some people choose to use their GPS which doesn't always provide the most direct or fastest route. Our property is in a country neighborhood. Overall I thinks the majority of my guests find my home to their surprise and liking. We will continue to improve it and we hope guests will continue to love it!